ARQIVA Gateway approved training provider – For all persons required to access flat roofs. Provides information on potential hazards with discussion of permanent and temporary methods of fall protection. 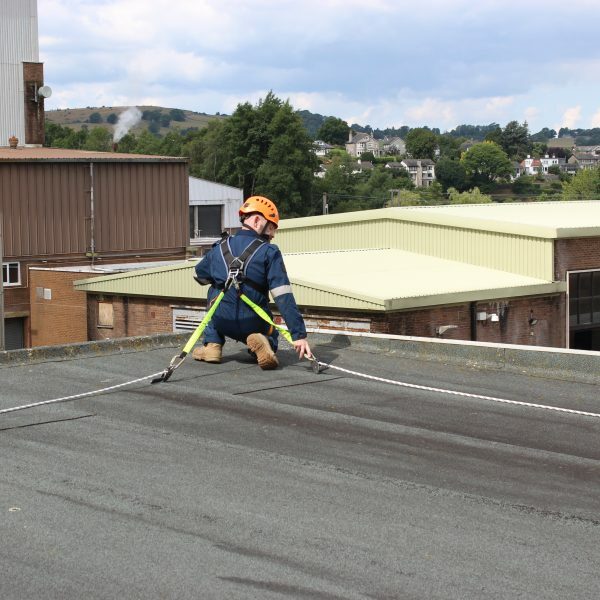 This Roof Safety, Access and Fall Protection course provides information and practical training on a range of temporary and permanent fall protection systems used for work on roofs. This roof safety course also includes basic information on radio frequency hazards. For all persons required to access flat roofs which offer a suitable working surface. This course does not cover work systems to access fragile roofs. Please note: RF section is not sufficient to gain access to Arqiva sites – please see TSK4U RF Hazards Awareness & Monitoring half day course for detailed knowledge on the effects of RF on the human body and the means of identifying danger areas. The characteristics of various commercially available fall protection systems are discussed and candidates are able to gain practical experience of each method. Summary information is also provided on requirements for the use of mobile elevated work platforms, temporary scaffolds and portable ladders. Provides information on potential hazards with discussion of permanent and temporary methods of fall protection. ACWAHT (Advisory Committee for Work at Height Training) syllabus is also covered in this course. This Roof Safety, Access and Fall Protection training course includes ARQIVA Gateway approved content. Minimum age 18. Must be fluent in English. Practical assessment of correct selection and use of equipment. Written paper. Reasonable medical fitness. A self-certified statement of reasonable fitness will be requested prior to attendance.